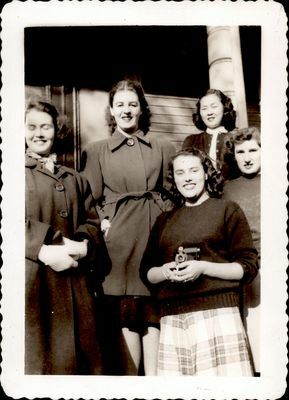 Photograph of Mary Lou Ellis, Pat Hadden, Frances Sakumoto, Nancy Shaw, and Eileen Sheehan (clockwise starting on the left) standing on the steps to a building. Eileen is holding a camera in front of her. Donated by Hannah Roberts.